Ransomware Shield secures your personal photos, documents, and other files from being modified, deleted, or encrypted by ransomware attacks. This feature scans and automatically secures folders that may contain personal data and allows you to specify which other folders you want to protect from untrusted applications. Additionally, you can specify which applications are allowed to modify the files in your folders and which applications are always blocked. 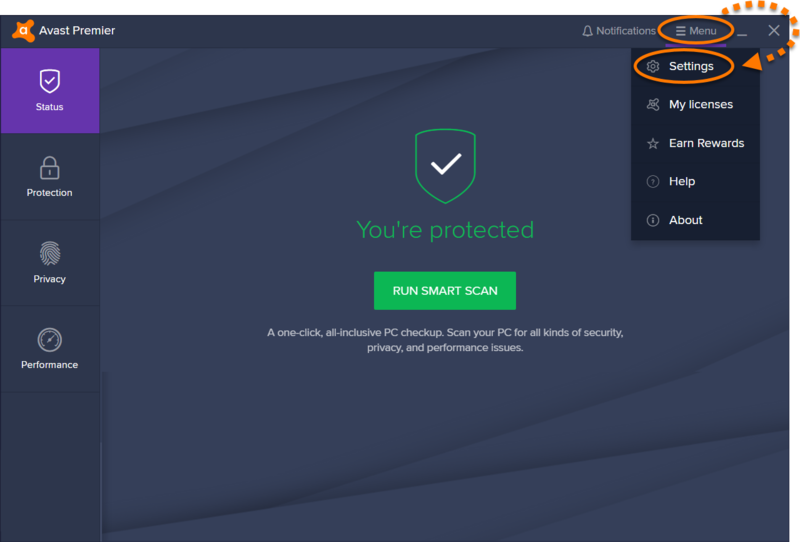 This feature is available for Avast Ultimate, Avast Premier, and Avast Internet Security. By default, Ransomware Shield scans and automatically secures folders where your personal data might be stored. Click the Protection tile in the left menu and select Ransomware Shield. To add a folder: click the Add folder tile, select a folder you want to protect on your PC, and click OK to confirm. To remove a folder: click the trash bin icon on the tile of the relevant folder, and click Stop Protecting to confirm. To specify which types of files are protected in each folder, click Change protected file types. All listed file types are selected by default. Untick the box next to a file type to deselect it, then click the red X to return to the main Ransomware Shield screen. 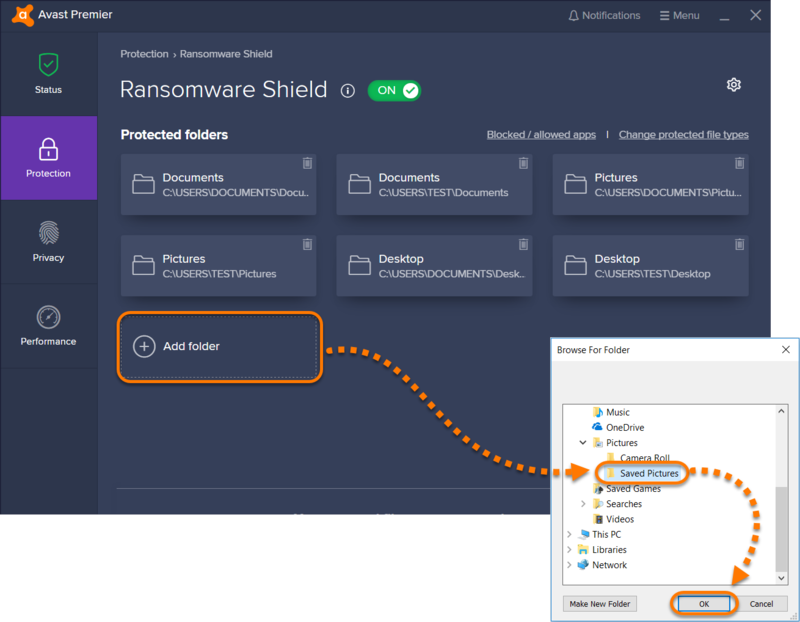 Ransomware Shield blocks malware and viruses from modifying files in your protected folders and allows trusted applications by default. 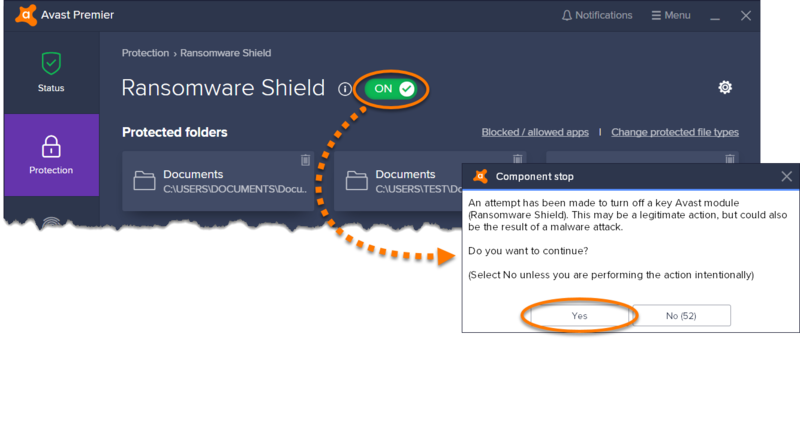 When an untrusted application attempts to modify files in your protected folders, a Ransomware Shield notification appears automatically, asking you to block or allow the application. After selecting your preference, the application is added to either the Blocked Applications or Allowed Applications list. Click Blocked/allowed apps and select your preferred action. Select an application and click Open to confirm. The selected application will now appear as a Blocked or Allowed application. You can specify how Ransomware Shield behaves when an application attempts to access files in your protected folders. Smart mode (default and recommended setting): Ransomware Shield refers to a list of commonly used and trusted applications to determine which programs can modify files in your protected folders. If any applications that are not in this list attempt to modify files in your protected folders, you are notified and asked for permission. Strict mode: If any applications attempt to modify files in your protected folders, you are notified and asked for permission every time (excluding those you have already added to the Blocked / allowed apps lists). Selecting this option may result in frequent and potentially obtrusive alerts. 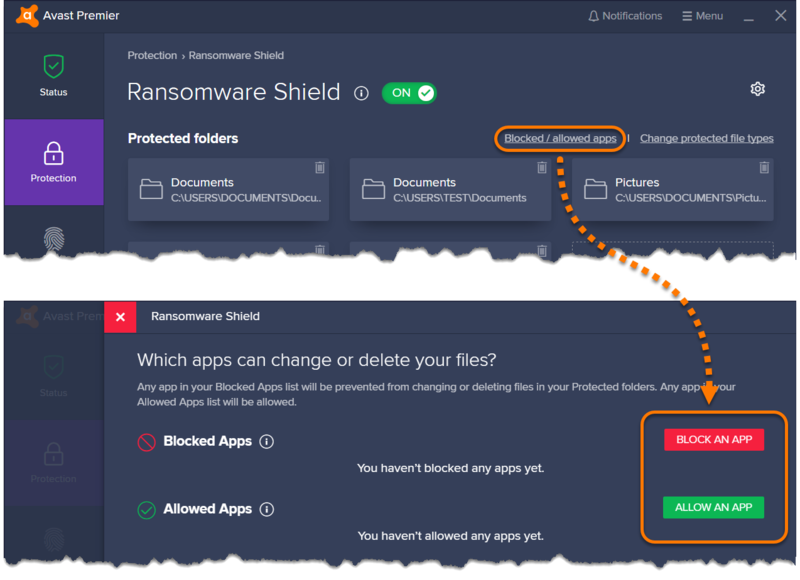 When a Ransomware Shield pop-up notification appears, click Allow app to add the program to a list of permitted applications, or click Block app to always block the application from modifying files in your protected folders. Additionally, you can manage your blocked and allowed applications by clicking Blocked / allowed . 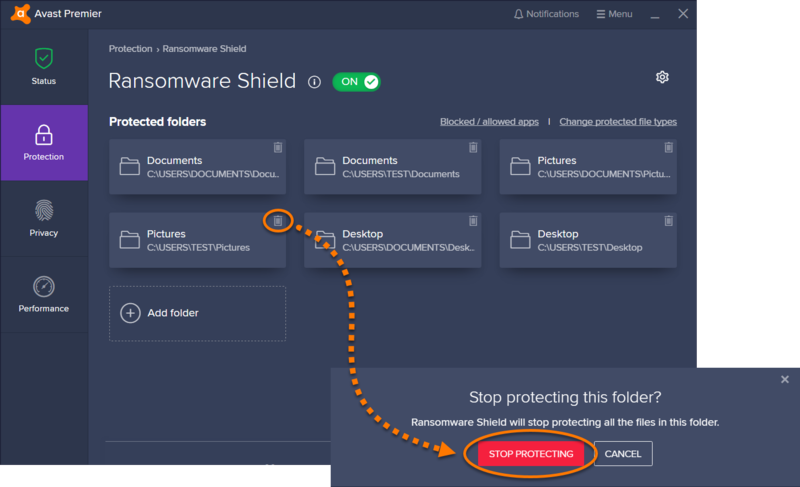 Ransomware Shield is enabled by default to secure your personal photos, documents, and other files from being modified, deleted, or encrypted by ransomware attacks. In some cases, Ransomware Shield can be disabled for troubleshooting purposes. Click the slider next to Ransomware Shield so that it changes from green (ON) to red (OFF), and select Yes if prompted by the Avast permissions dialog. Ransomware Shield is now disabled. To enable it, follow steps 1-3 above, then click the slider so that it changes from red (OFF) to green (ON). You can configure certain Ransomware behaviors and define protected file types to protect your personal data according to your preferences. Select Protection ▸ Ransomware Shield. Select Smart or Strict mode. Click View allowed / blocked apps and add an application to either list. Specify which File types you want to protect in each folder. All listed file types are selected by default. Untick the box next to a file type to deselect it. Additionally, you can specify a file type not listed, by adding it manually into the box below the default list. Additionally, access Ransomware Shield settings by clicking the settings (gear icon) in the top-right corner of the Ransomware Shield feature screen. This feature is not available in Avast Pro Antivirus or Avast Free Antivirus. 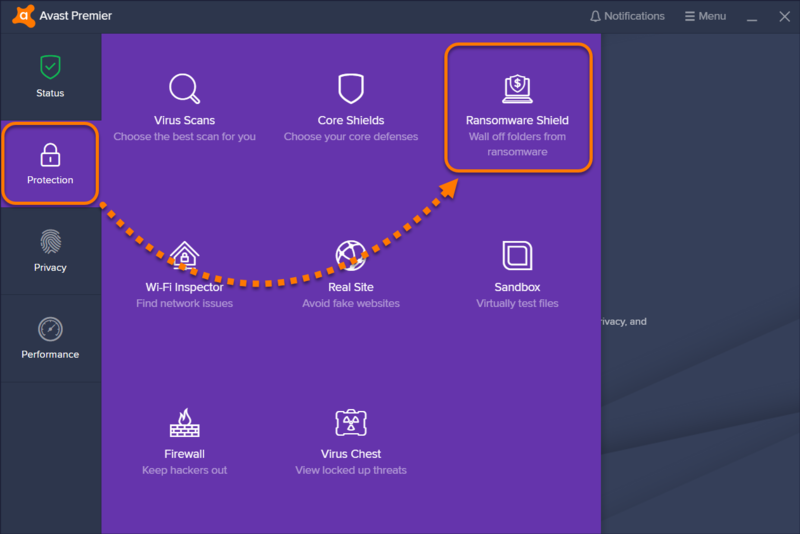 Ransomware Shield does not appear in the main menu: ensure you are using the latest version of Avast Ultimate, Avast Premier, or Avast Internet Security. To update Avast, go to ☰Menu ▸ Settings ▸ Update, and click Update in the Program section. 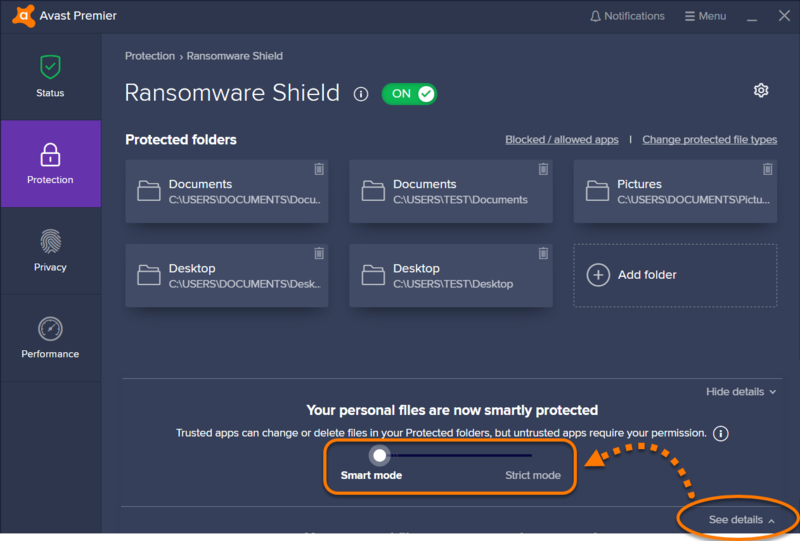 Ransomware Shield displays popups too often: if you receive too many notifications from Avast asking you to block or allow applications, ensure your Ransomware Protection sensitivity is set to Smart Mode. 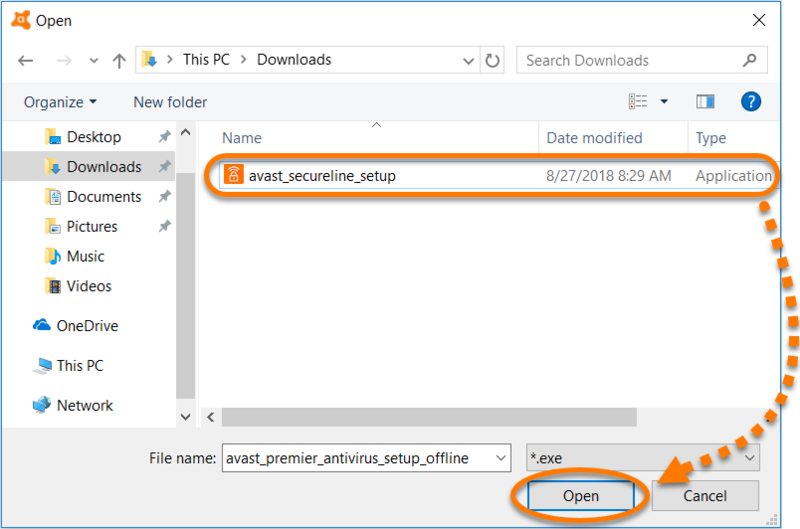 If you select Strict Mode, Avast notifies you every time any application attempts to modify files in your protected folders (excluding those you have already added to the Blocked / Allowed apps lists). You cannot save files using an editing application: ensure the application you are using is not in your Blocked Apps list. Alternatively, you can add the application to your Allowed Apps list.